Just like everything else connected with William Hope Hodgson, “collecting Hodgson” is not a particularly easy task. Even the books that have been released since the 1970s can be hard to track down particularly as many were published by small presses in limited editions. The Arkham House editions of HOUSE ON THE BORDERLAND, DEEP WATERS and even CARNACKI are fairly easy to find. However, they’re not particularly cheap when you find them. It gets even more difficult the further back you go. It is when you look for the first editions that you start seeing serious prices! I have seen rare book dealers list some of these for low 5 figures. Although not as plentiful as the ‘cheap’ editions, these do occasionally surface. What one doesn’t see often are first editions SIGNED by Hodgson! These are probably the rarest Hodgson editions today. 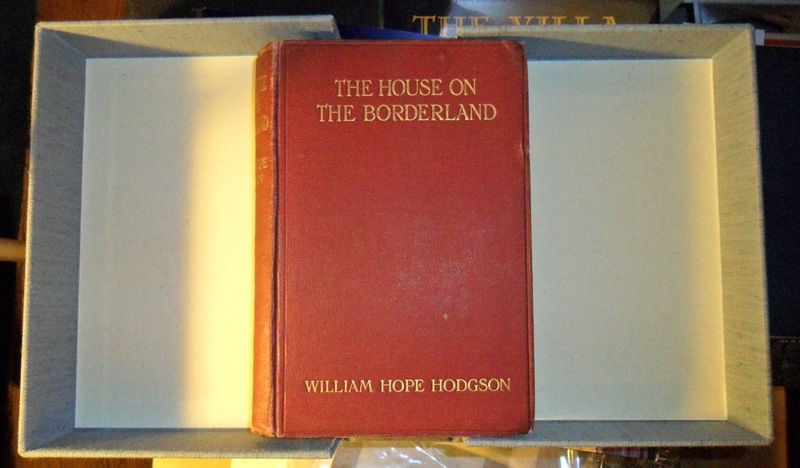 Recently, a “collector” shared with me photographs of his prized edition of a signed first edition of The House on the Borderland. 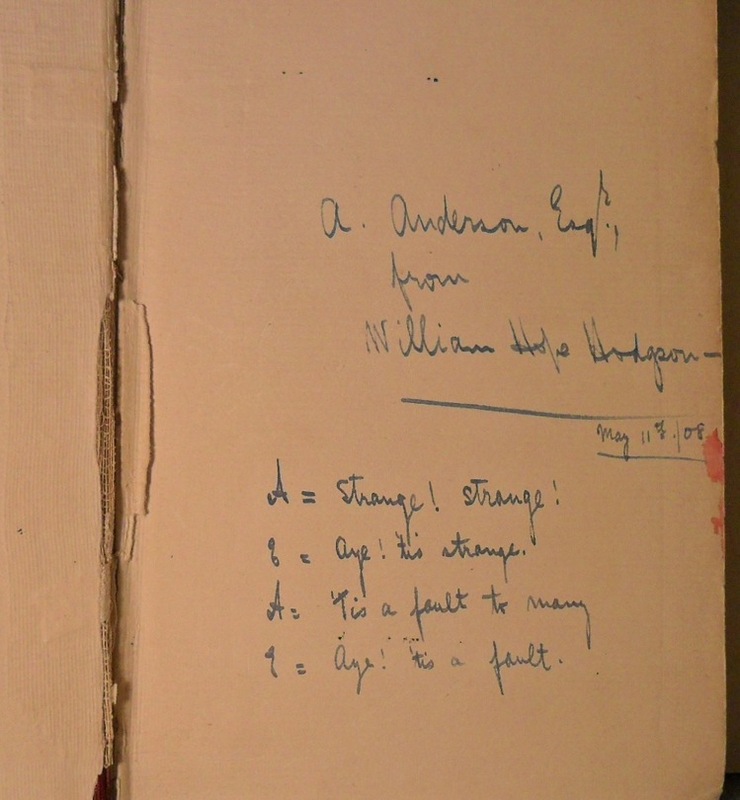 This particular copy was actually signed by Hodgson to someone and includes a little note as well. This is one of the rarest Hodgson first editions I have ever seen. I am not sure who the person was that Hodgson presented this copy to but I assume it was someone that WHH knew and was on friendly terms with given the lighthearted tone of the inscription. The “collector” was kind enough to grant me permission to post these on the blog. 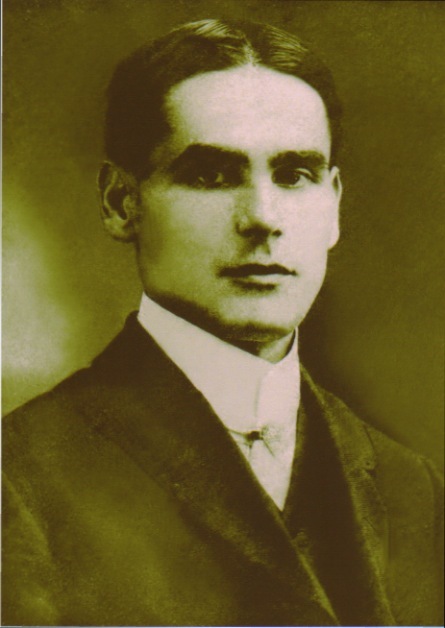 I thought that many would like seeing this rare (and very envious) piece of Hodgsonian. It also strikes me that many readers of this blog may never have seen an example of Hodgson’s handwriting or signature before! This shows that there are such excellent items out there but I fear that they are few in number. Plus, of course, extremely costly! It’s a minor point, but to my eye – and I spend a lot of time rummaging around in them – the box is a proper archive box, ie made from acid free card which does not go on – over time – to corrode the paper: a perfect backdrop to the photo really given the obvious value of its contents. As for the book prices, I have decided to get the electronic versions of my favourite authors (for free, if it is possible; a lot of classic literature is legally free) because if I resorted to buying the material books I would be ruined oversoon. Yes, I know; if you love literature, there is nothing like a nice paper book (bound, if possible); but sometimes the book prices seem to be inordinately exorbiant and I am not definitely going to be sponged on by anybody. I may be mistaken (I often am) but I believe that box is the type of container that many libraries store their old volumes in to prevent sunlight and other damaging factors. I think that the ‘collector’ probably stores it like this to protect it and just happened to use it as the background. Interesting and valuable item; but I think the book would deserve a better photographic background than an old cardboard or what it is .-) no offence, guv’nor. As for the prices of old books, I have found out they are unballanced sometimes; the other day I bought Guy de Maupassant’s collection of horror tales (1928) which cost me 1/15 of the price I paid for Machen’s “The Three Imposters” and “The Red Hand” in one publication(1929). Book is book, but I have decided to get electronic versions of my favourite writers (free, if it is possible; a lot of the old horror classics is legally available, thank god) because buying the physical paper books would ruin me.